Sitting at the piano accompanying the choir at my girls’ grammar school around 1964, I did not know that the girl at the piano was an iconic image in the history of women’s education, or that the Schools Inquiry Commission (1868) saw piano playing as a t“showy accomplishments” that demonstrated the parlous state of girls’ education. … one of the considerations which mainly influence parents of the middle class when selecting a school for their daughters is that instrumental music is to be the leading subject of instruction for women except in the lowest ranks of life. It is said to be seldom more than the acquisition of manual skill, to be taught without intelligence, and too much confined to instrumental music … A clear summary of reasons against the pianoforte for educational purposes; from the undue consumption of time, the impossibility of simultaneous teaching, its expensiveness, the embarrassment it causes in school arrangements. But no one would recommend its abandonment, through judicious heads of schools may be able to modify its use….. (Report of the Schools Inquiry Commission (London: HMSO, 1868), Vol.1 Chapter VI: Girls’ Schools, p.552). “Accomplishments” have an important place in the history of sociability in which women played a key role. And an undue emphasis on the deleterious effects of “accomplishments” in the history of women’s education runs the risk of hiding the efforts of women like those of the Society for Women Musicians who worked to advance women’s musical careers. 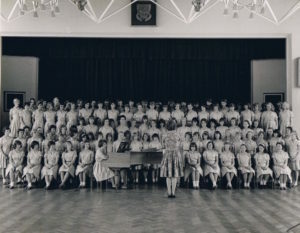 Their efforts meant that a career in music was seen as a more acceptable path for girls by the time I was accompanying the choir in the 1960s. It also obscures the efforts of music teachers, like Annie Warburton, to reform music teaching for girls along more inclusive and professional lines. But there is more to this photograph than simply an iconic image or an indication of changes in girls’ schooling. In Thinking Through Sonorities in Histories of Schooling, I ask questions about how researchers might approach sound, sight and touch to tap the memories that images like this evoke. What of the sounds of singing, the physicality of playing the piano, the emotions that accompany musical performance, or the sounds that reverberate through spaces and escape the confines of halls and classrooms into corridors and crannies in unsettling ways? And I ask what “bodily readings’ of such images might suggest, not just about the struggle of the rights of women for musical careers, but also about a politics of possibility for girls at school. Goodman, Joyce. “Experimenting with Sound and Silence: Sonorous Bodies, Sonic Selves, Acoustic Topographies and Auditory Histories of Schooling.” Paedagogica Historica 53, no. 5 (2017): 528-41. Goodman, Joyce, and Andrea Jacobs. 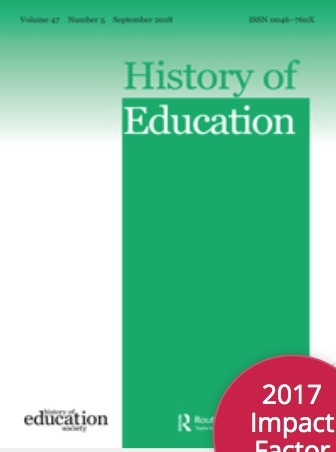 “Musical Literacies in the English Inter‐War Secondary‐School Classroom.” Paedagogica Historica 44, no. 1-2 (2008): 153-66. Goodman, Joyce, and Andrea Jacobs. “The Music Teacher in English Girls’ Secondary Schools before 1939.” Women’s History Magazine 55, no. Spring (2007): 12-20.